Takes the Heat Like No Other! A great variety—for both Northern and Southern gardens! Hardy Tarty has exceptional heat tolerance, thriving in hot climates as well as cooler ones. Produces gorgeous red, thick, non-stringy stalks. A tasty, tart and colorful addition to pies and other recipes! Compact plants rarely bolt and reach a mature height of 24-30 inches. 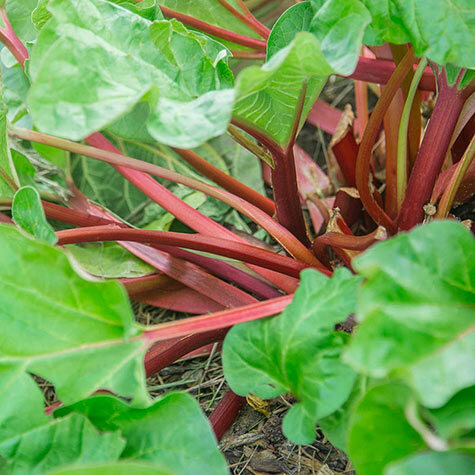 Rhubarb, like Hardy Tarty, is a perennial vegetable that can be harvested for several months from spring to summer. Zones 3-8. Depth: Plant divisions 3 - 4 inches below the soil surface. Plant early Spring or Fall. Foliage: Green leaves atop greenish-red stalks. Fruit: Large, firm stalks, 12-15 inches. Good texture with very little fiber - non-stringy. Red color inside and out. Lemony-tart flavor. Soil Requirements: Well-drained, rich, loamy soil that is fortified with compost or well-rotted manure. pH between 6.0 and 6.8. Comments: Large, firm, smooth stalks stand out in shades of red. Nice red interior, too. Thick stalks have a nice texture with very little fiber-non-stringy. Good lemony-tart flavor, but not overly sour. Adds lots of color to your favorite recipes.